These bins are made of polycarbonate which is 35 TIMES stronger than acrylic (virtually indestructible). NSF approved! 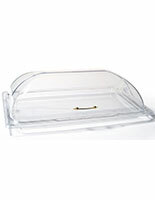 Tight fitting clear lid maintains freshness and keeps bugs out. Overall 21"h x 23"d x 9"w dimensions hold 12 gallons of dry foods. 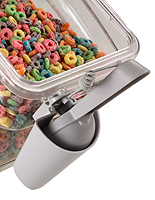 Sliding door stays up for scooping, then closes easily to maintain your food's freshness. 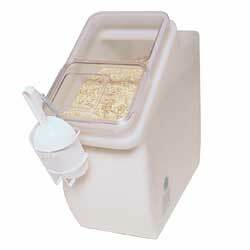 This bulk food bin is capable of accommodating and keeping fresh over 12 gallons of dry foods. Restaurants, buffets, catering companies, and other companies within the eatery industry can place all sorts of edibles within the container. 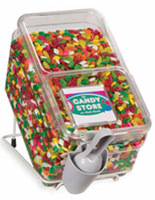 This bulk food bin is perfect for cereals, candies, ice cream toppings, rice, and any other dry food. 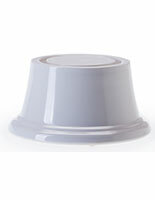 The container prevents UV rays from affecting the edibles from going stale. This bulk food bin is NSF approved with a clear sliding lid. Employees and customers are able to quickly slide open the door for easy access to the contents. This bulk food bin has overall dimensions 21"h x 23"d x 9"w for a variety of functions in an eatery. Users can implement the display in full view or hide it behind the counter. This bulk food bin comes with a sign holder on the lid for demarcating the contents of the container. 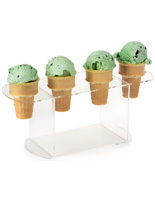 The label holder allows users to quickly change the signage when the edibles inside change. 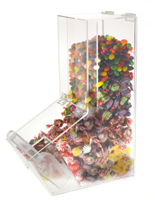 This bulk food bin is constructed from durable polycarbonate, which is much stronger than conventional acrylic. 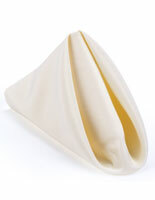 The material is stain resistant, and will not chip or crack after consistent use. This bulk food bin has seamless rounded corners to eliminate the trapping of the contents. The construction makes all of the edibles easily accessible. This food bin is very easy to clean because it is one piece. 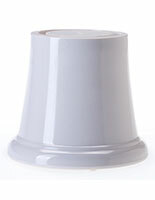 The restaurant accessory is dishwasher safe for simple care. All of the parts of this unit are recyclable. The manufacturing methods used to create this display generate little waste for an environmentally friendly container. Optional scoops, spoons, tongs, and holsters are sold separately from this model. 8.3" x 20.0" x 23.0"